This article is about B4C. For other boron carbides, see Boron carbides. Boron carbide (chemical formula approximately B4C) is an extremely hard boron–carbon ceramic, and covalent material used in tank armor, bulletproof vests, engine sabotage powders, as well as numerous industrial applications. With a Vickers Hardness of >30 GPa, it is one of the hardest known materials, behind cubic boron nitride and diamond. Boron carbide was discovered in 19th century as a by-product of reactions involving metal borides, but its chemical formula was unknown. It was not until the 1930s that the chemical composition was estimated as B4C. Controversy remained as to whether or not the material had this exact 4:1 stoichiometry, as, in practice the material is always slightly carbon-deficient with regard to this formula, and X-ray crystallography shows that its structure is highly complex, with a mixture of C-B-C chains and B12 icosahedra. These features argued against a very simple exact B4C empirical formula. Because of the B12 structural unit, the chemical formula of "ideal" boron carbide is often written not as B4C, but as B12C3, and the carbon deficiency of boron carbide described in terms of a combination of the B12C3 and B12CBC units. The ability of boron carbide to absorb neutrons without forming long-lived radionuclides makes it attractive as an absorbent for neutron radiation arising in nuclear power plants and from anti-personnel neutron bombs. Nuclear applications of boron carbide include shielding, control rod and shut down pellets. Within control rods, boron carbide is often powdered, to increase its surface area. Fragment of the B4C crystal structure. 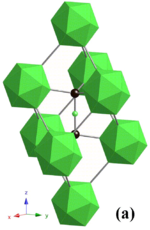 Boron carbide has a complex crystal structure typical of icosahedron-based borides. There, B12 icosahedra form a rhombohedral lattice unit (space group: R3m (No. 166), lattice constants: a = 0.56 nm and c = 1.212 nm) surrounding a C-B-C chain that resides at the center of the unit cell, and both carbon atoms bridge the neighboring three icosahedra. This structure is layered: the B12 icosahedra and bridging carbons form a network plane that spreads parallel to the c-plane and stacks along the c-axis. The lattice has two basic structure units – the B12 icosahedron and the B6 octahedron. Because of the small size of the B6 octahedra, they cannot interconnect. Instead, they bond to the B12 icosahedra in the neighboring layer, and this decreases bonding strength in the c-plane. Because of the B12 structural unit, the chemical formula of "ideal" boron carbide is often written not as B4C, but as B12C3, and the carbon deficiency of boron carbide described in terms of a combination of the B12C3 and B12C2 units. Some studies indicate the possibility of incorporation of one or more carbon atoms into the boron icosahedra, giving rise to formulas such as (B11C)CBC = B4C at the carbon-heavy end of the stoichiometry, but formulas such as B12(CBB) = B14C at the boron-rich end. "Boron carbide" is thus not a single compound, but a family of compounds of different compositions. A common intermediate, which approximates a commonly found ratio of elements, is B12(CBC) = B6.5C. Quantum mechanical calculations have demonstrated that configurational disorder between boron and carbon atoms on the different positions in the crystal determines several of the materials properties - in particular, the crystal symmetry of the B4C composition and the non-metallic electrical character of the B13C2 composition. Boron carbide is known as a robust material having high hardness, high cross section for absorption of neutrons (i.e. good shielding properties against neutrons), stability to ionizing radiation and most chemicals. Its Vickers hardness (38 GPa), Elastic Modulus (460 GPa) and fracture toughness (3.5 MPa·m1/2) approach the corresponding values for diamond (1150 GPa and 5.3 MPa·m1/2). As of 2015[update], boron carbide is the third hardest substance known, after diamond and cubic boron nitride, earning it the nickname "black diamond". Boron carbide is a semiconductor, with electronic properties dominated by hopping-type transport. The energy band gap depends on composition as well as the degree of order. The band gap is estimated at 2.09 eV, with multiple mid-bandgap states which complicate the photoluminescence spectrum. The material is typically p-type. If magnesium is used, the reaction can be carried out in a graphite crucible, and the magnesium byproducts are removed by treatment with acid. Personal and vehicle anti-ballistic armor plating. High-pressure water jet cutter nozzles. Scratch and wear resistant coatings. Neutron absorber in nuclear reactors. High energy fuel for solid fuel Ramjets Zip fuel. ^ Gray, Theodore (2012-04-03). The Elements: A Visual Exploration of Every Known Atom in the Universe. Black Dog & Leventhal Publishers. ISBN 9781579128951. Retrieved 6 May 2014. ^ "Rutgers working on body armor". Asbury Park Press. August 11, 2012. Retrieved 2012-08-12. ... boron carbide is the third-hardest material on earth. ^ a b Balakrishnarajan, Musiri M.; Pancharatna, Pattath D.; Hoffmann, Roald (2007). "Structure and bonding in boron carbide: The invincibility of imperfections". New J. Chem. 31 (4): 473. doi:10.1039/b618493f. ^ a b Zhang FX, Xu FF, Mori T, Liu QL, Sato A, Tanaka T (2001). "Crystal structure of new rare-earth boron-rich solids: REB28.5C4". J. Alloys Compd. 329: 168–172. doi:10.1016/S0925-8388(01)01581-X. ^ a b Greenwood, Norman N.; Earnshaw, Alan (1997). Chemistry of the Elements (2nd ed.). Butterworth-Heinemann. p. 149. ISBN 978-0-08-037941-8. ^ a b c Domnich, Vladislav; Reynaud, Sara; Haber, Richard A.; Chhowalla, Manish (2011). "Boron Carbide: Structure, Properties, and Stability under Stress" (PDF). J. Am. Ceram. Soc. 94 (11): 3605–3628. doi:10.1111/j.1551-2916.2011.04865.x. Retrieved 23 July 2015. ^ Ektarawong, A.; Simak, S. I.; Hultman, L.; Birch, J.; Alling, B. (2014). "First-principles study of configurational disorder in B4C using a superatom-special quasirandom structure method". Phys. Rev. B. 90 (2): 024204. arXiv:1508.07786. Bibcode:2014PhRvB..90b4204E. doi:10.1103/PhysRevB.90.024204. ^ Ektarawong, A.; Simak, S. I.; Hultman, L.; Birch, J.; Alling, B. (2015). "Configurational order-disorder induced metal-nonmetal transition in B13C2 studied with first-principles superatom-special quasirandom structure method". Phys. Rev. B. 92: 014202. arXiv:1508.07848. Bibcode:2015PhRvB..92a4202E. doi:10.1103/PhysRevB.92.014202. ^ Sairam, K.; Sonber, J.K.; Murthy, T.S.R.Ch. ; Subramanian, C.; Hubli, R.C. ; Suri, A.K. (2012). "Development of B4C-HfB2 composites by reaction hot pressing". Int.J. Ref. Met. Hard Mater. 35: 32–40. doi:10.1016/j.ijrmhm.2012.03.004. ^ "Boron Carbide". Precision Ceramics. Archived from the original on 2015-06-20. Retrieved 2015-06-20. ^ A. Sokhansanj; A.M. Hadian (2012). "Purification of Attrition Milled Nano-size Boron Carbide Powder". 2nd International Conference on Ultrafine Grained & Nanostructured Materials (UFGNSM). International Journal of Modern Physics: Conference Series. 5: 94–101. Bibcode:2012IJMPS...5...94S. doi:10.1142/S2010194512001894. Alan W. Weimer (1997). Carbide, Nitride and Boride Materials Synthesis and Processing. Chapman & Hall (London, New York). ISBN 0-412-54060-6. This page was last edited on 25 December 2018, at 01:13 (UTC).